I normally have a few words to say about the announcements that Apple makes at their annual developer conference, and this year is no exception. The features of iOS 10 are (broadly) not hugely relevant to our current apps. It’s not possible for any of our apps to integrate with Siri; none really lend themselves to plugging into Messages. I feel that CameraGPS probably works best as a separate app rather than trying to plug into Maps (and I’m not even sure it would be possible). But there are opportunities for new apps that — time permitting — may see the light of day. Watch this space. At the time of writing, it’s my intention to make sure that all our apps continue to work on iOS 10. This is a much bigger update for CameraGPS than the others, as it relies on a feature that has been deprecated. Having said that, from a user perspective it seems to be a nice release. Even the first beta is relatively stable, though not good enough (in my opinion) for your main phone. The story is similar on macOS Sierra. 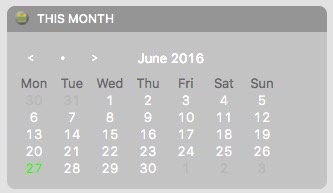 Quick Calendar runs just fine on the first beta build (though I might need to tweak some of the colours!). It looks and works pretty much the same as El Capitan, which I mean as a compliment. I’m not sure how much I’ll use Siri. I think I’d be embarrassed to use it in a crowded office! So, overall, Apple’s announcements don’t change very much for Wandle Software’s apps. But they still look to be good releases! Keep an eye out for the final versions in September!